Update: The house sold for $215,000 on February 22, 2018. 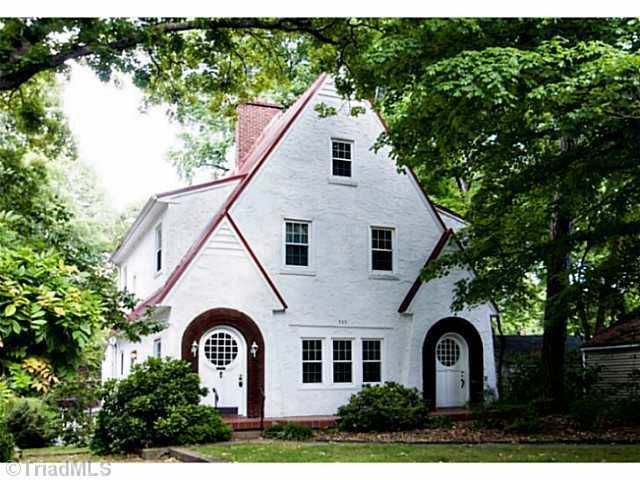 There aren’t too many Spanish Revival homes in Greensboro, so the few we have tend to stand out. That’s especially true for 307 S. Tremont Drive, a beautifully restored Sunset Hills home that went on the market last week for $224,900. The market is strong for houses in the older neighborhoods west of downtown; I’m a little surprised this house is still for sale after a week. That could change after an open house on Sunday. The house has three bedrooms and one bath, 1,605 square feet. That comes out to $140 per square foot, right about at the median this year for Sunset Hills, though way closer to the bottom than the top. Six classic homes have sold for less and seven for more. Prices have ranged from $128 per square foot to $187. The interior is beautiful, with hardwood floors, arched doorways, built-in cabinets and shelves, very nice radiator covers and a telephone nook. The front has a patio and pergola; a deck looks over the backyard. Next door is one of the most whimsical homes in Greensboro. A similar house in Westerwood (not Spanish Revival, but similar in size, condition and price) was on the market for four days last month before the owner accepted an offer. Since mid-September, sellers of at least five other classic homes in older neighborhoods have accepted offers in less than a week. I’m not sure why 307 S. Tremont has taken longer than a week. Maybe it’s the dreary weather.